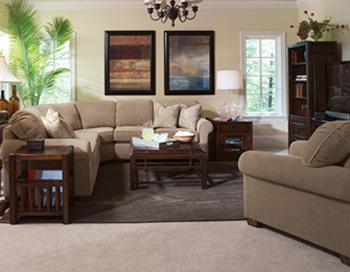 At Al’s Furniture, we do our best to provide high quality products at the best value for your money. That’s why we are proud to carry Flexsteel furniture. 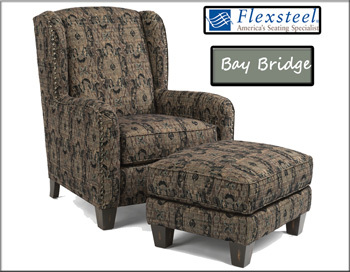 Flexsteel makes furniture that is built to last, nice to look at, and most importantly keeps you comfortable. 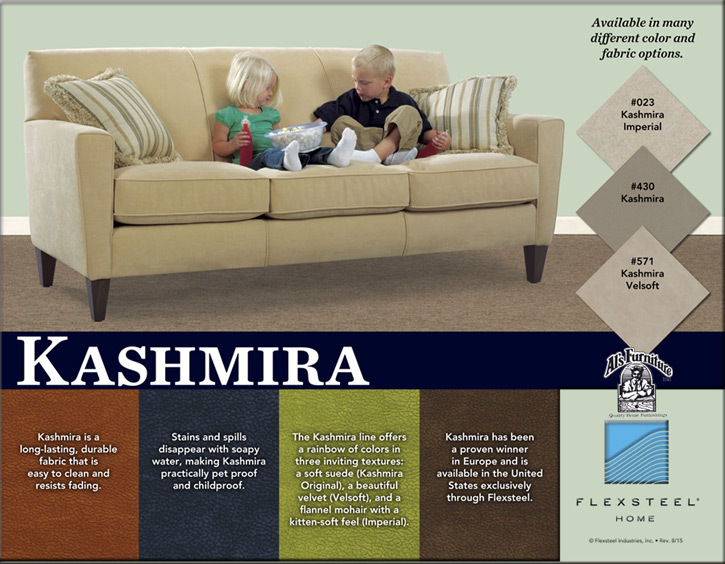 Flexsteel stationary sofas and loveseats have many different leather and fabric options to choose from. 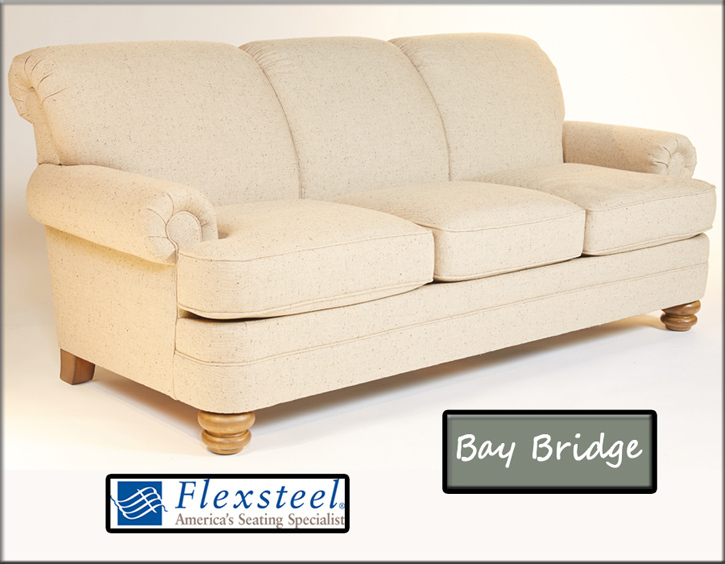 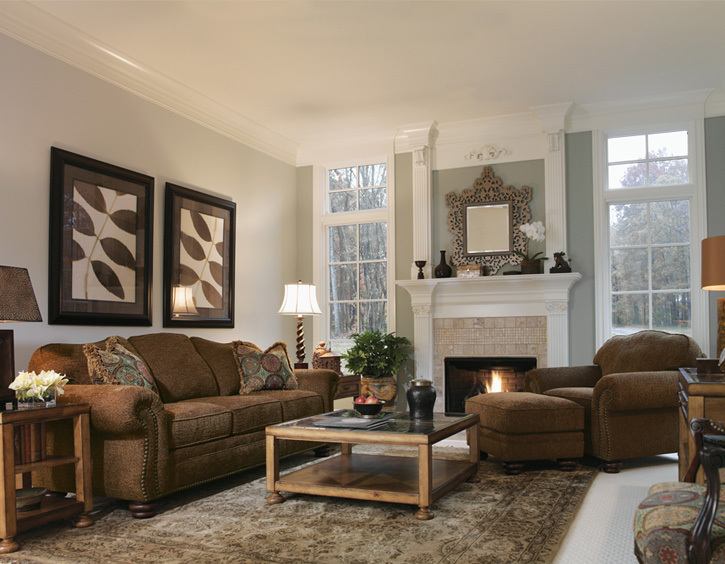 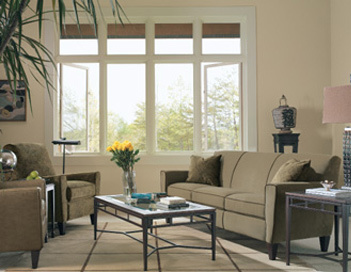 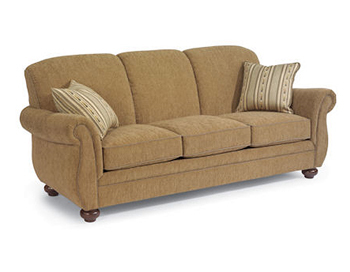 The Bay Bridge sofa group restores vintage charm with high style and quality. 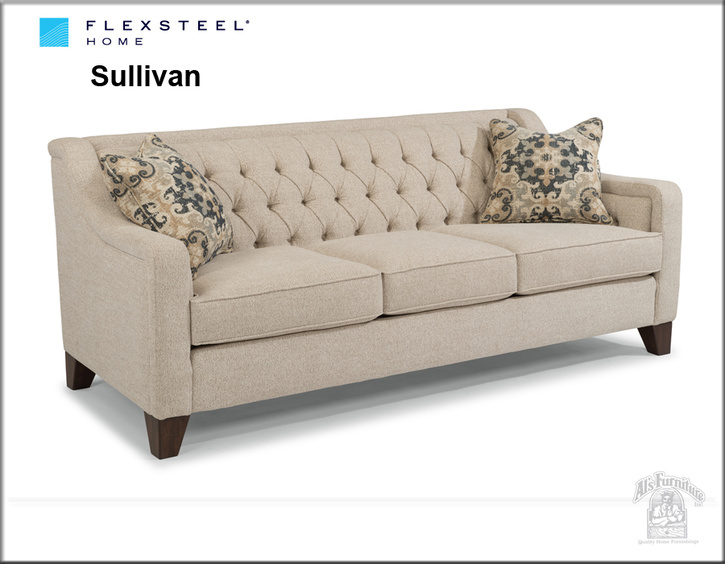 The roll back arms, nailhead trim, and spindle leg add luxury and nostalgia to any room. 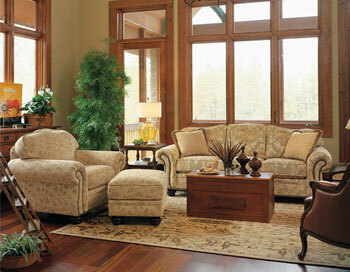 This living room collection features traditional furniture that blends well into formal or casual room settings. This group looks fantastic paired with the Perth chair from Flexsteel. 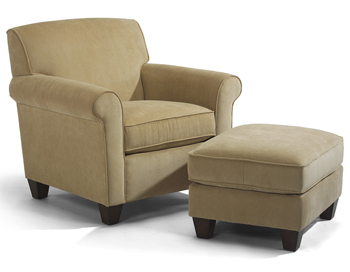 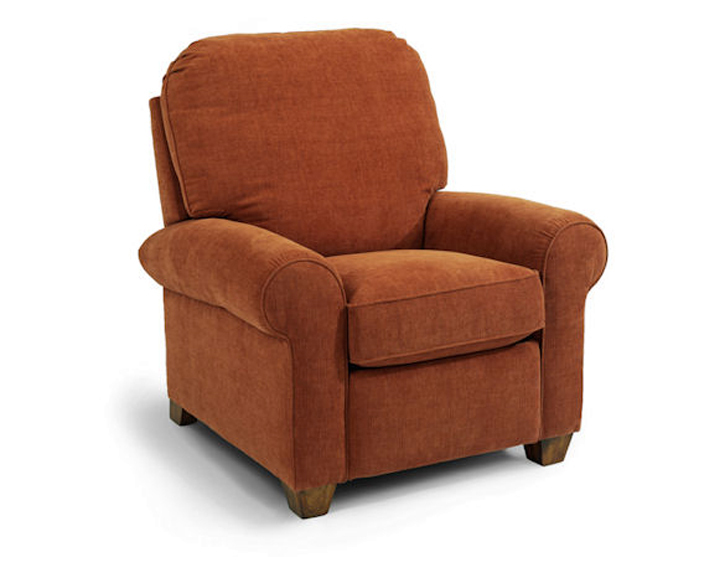 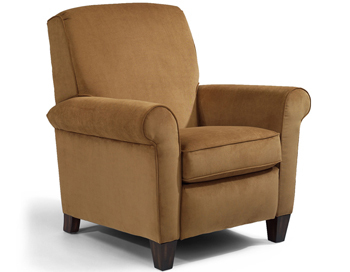 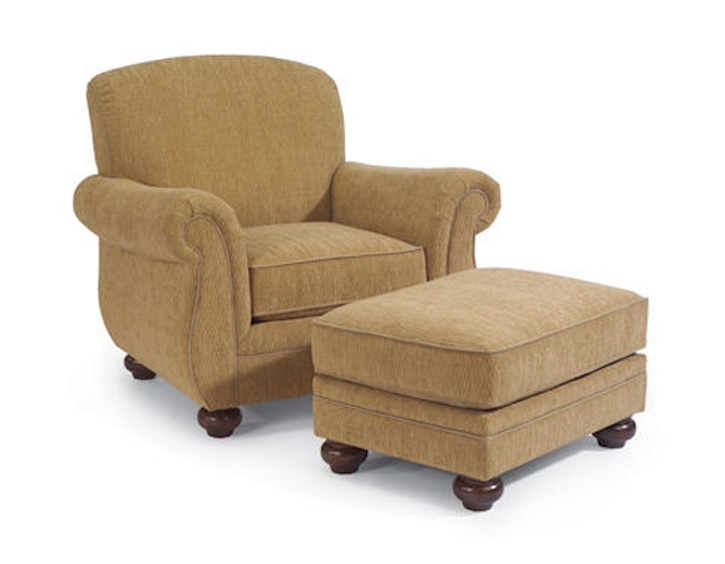 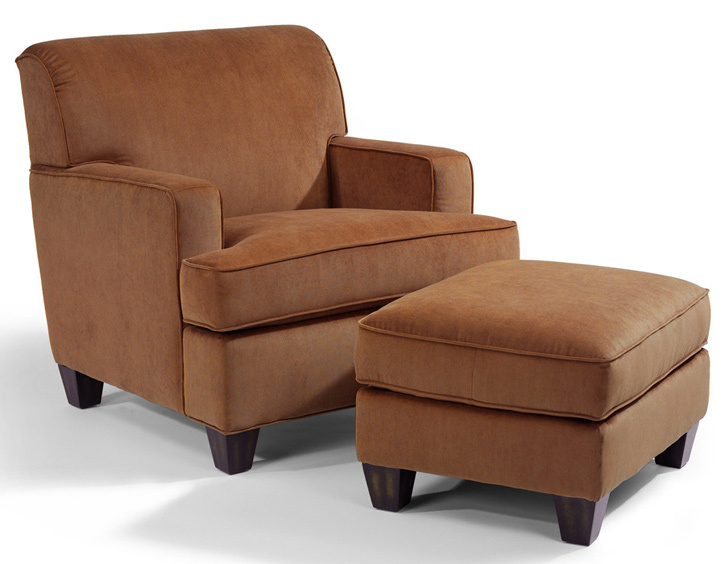 Its deep seat, nailhead trim and high back are a perfect combination of design and comfort. 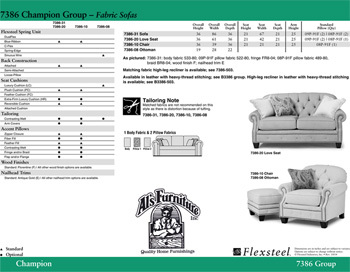 The sofa, loveseat, chair and ottoman, and sectional are available in 1,500 fabric options, so you can customize these groups to suit your home and lifestyle. 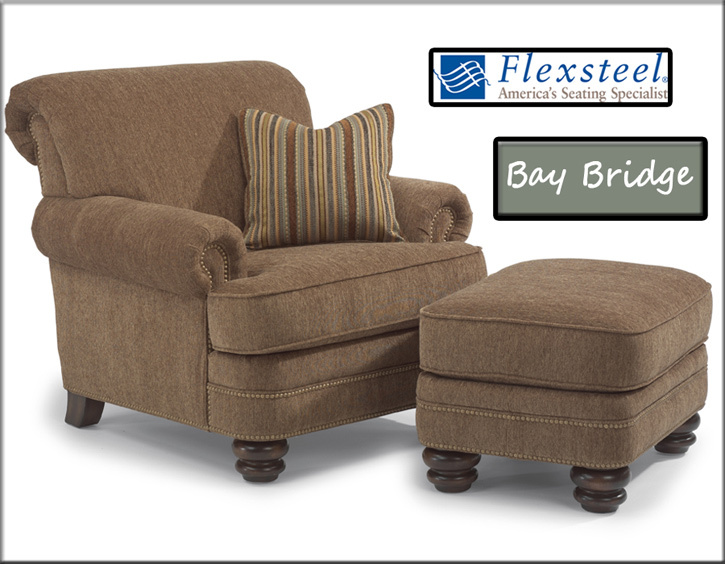 Come by Al’s Furniture and see the Bay Bridge collection for yourself. 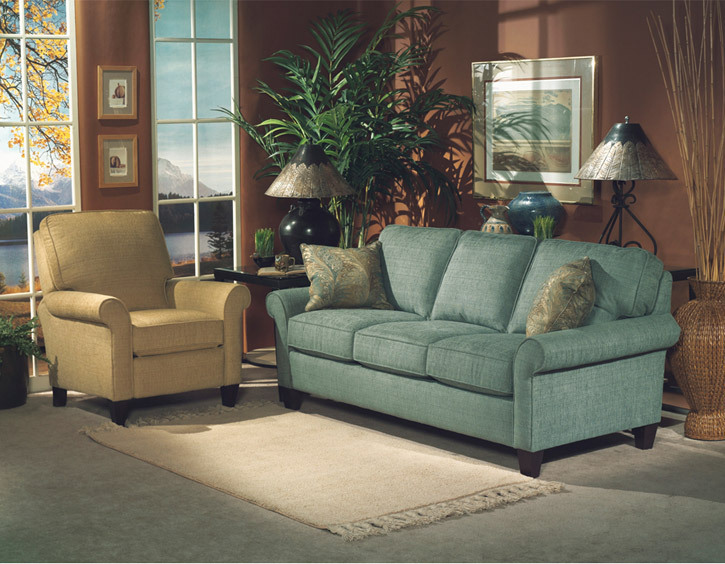 Enjoy the unique look and feel of this beautiful traditional style sofa in your living room or den. 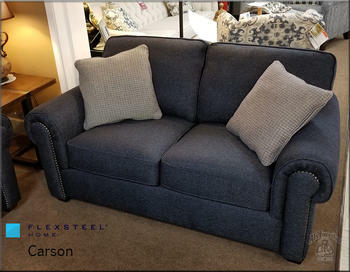 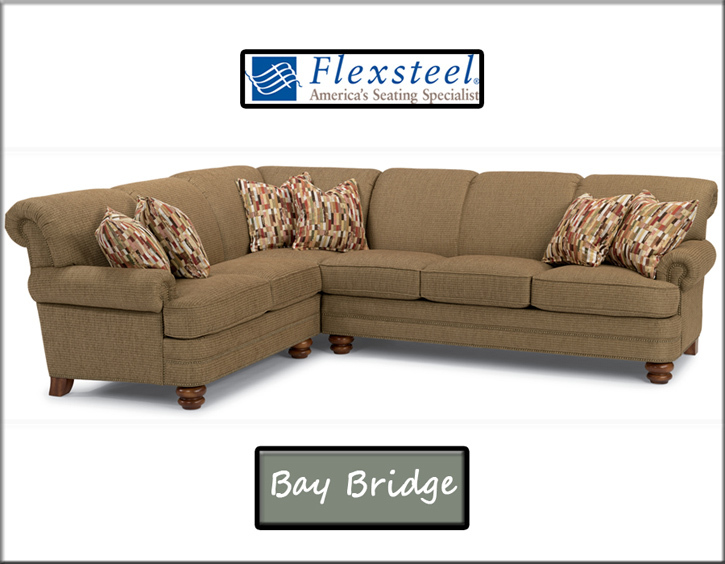 The Flexsteel Bexley Group features plush cushions, turned feet and a glittering nail head trim, this sofa is the perfect place to relax after a hard day at the office, or a great place to lounge in with a good book. Available in a variety of fabrics and leather options, this sofa works well in any decor, allowing you to customize your own personal style! 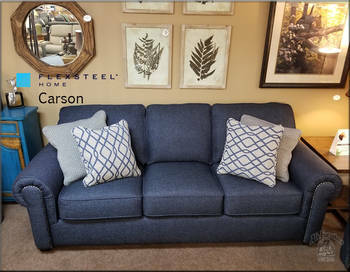 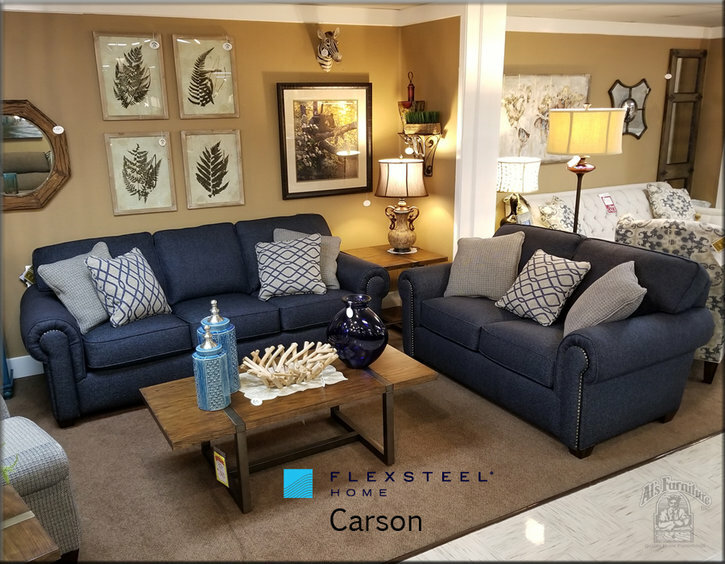 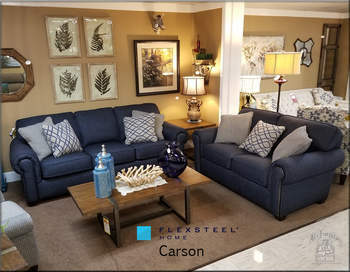 The Carson Collection by Flexsteel featuring Flexsteel’s time-tested Blue Steel spring system is an excellent addition to your home. Customize this sofa to create the look you want for your living room. Available in this collection is a sofa, loveseat, chair and ottoman, or sleeper sofa. Come to our Flexsteel Design Center and choose from 1,500 fabrics and leathers. 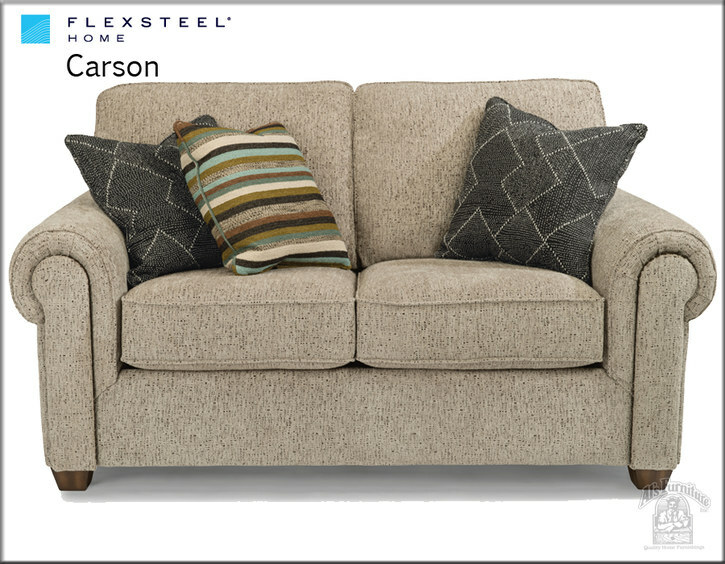 The Carson is available with or without nailhead trim. 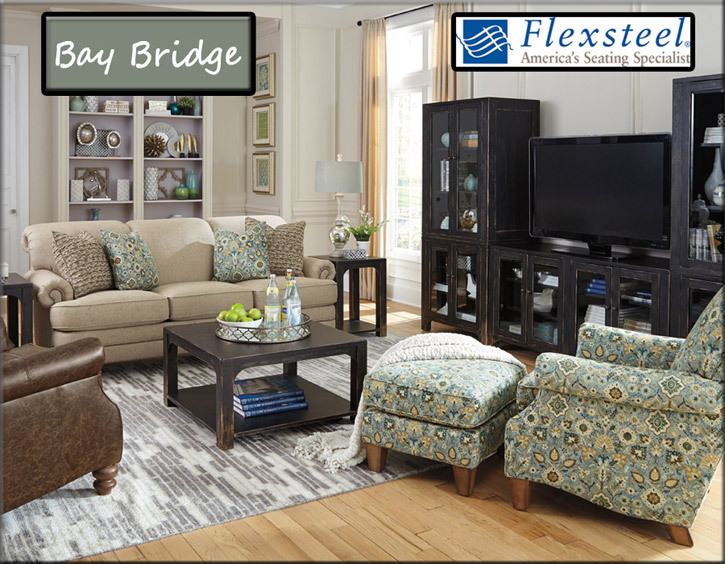 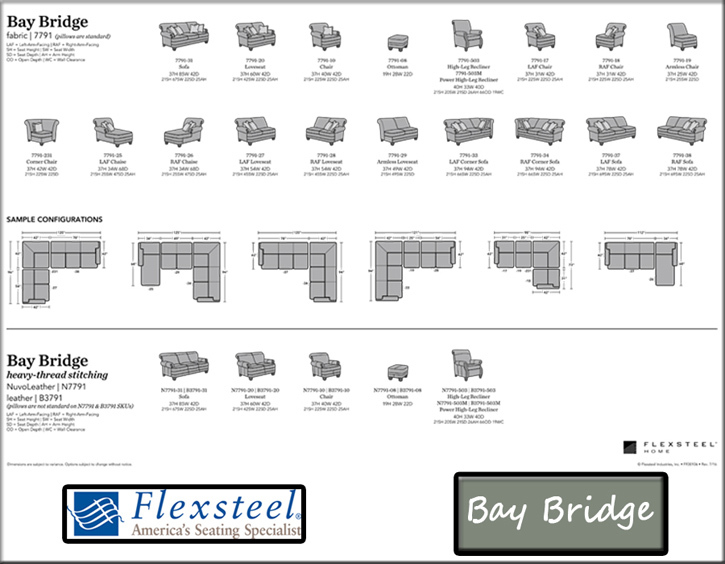 At Flexsteel, design and construction go hand in hand to create comfortable, long-lasting furniture with durable wood frames, the Blue Steel Spring system, and exceptionally soft seat cushions. 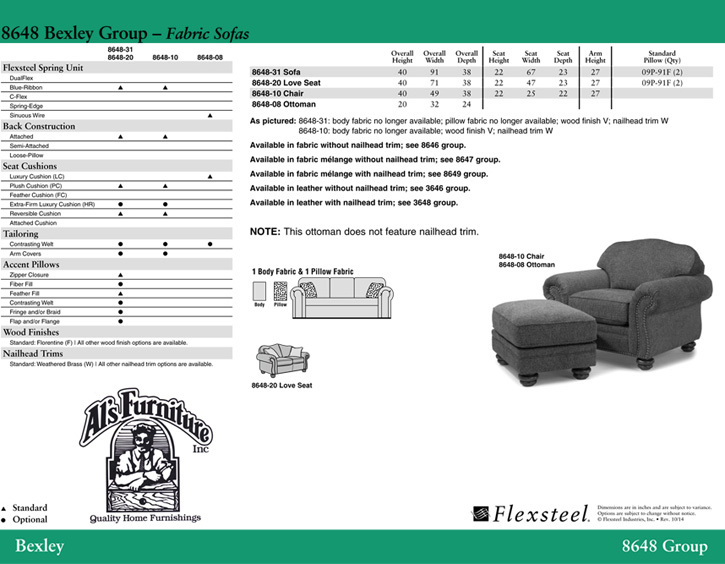 Al’s Furniture is the largest Flexsteel dealer in the Valley. 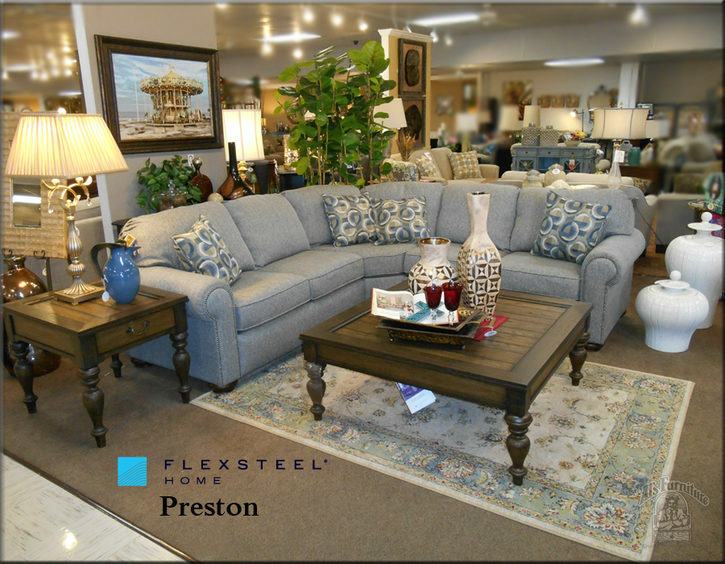 Come visit us today, and see all our furniture showroom has to offer. Create a living room that’s light and feminine, as well as cozy and comfortable, with the Flexsteel Champion Group. 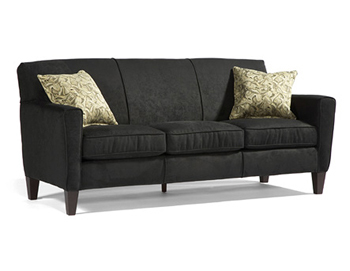 This button-tufted sofa is the perfect centerpiece for a sophisticated, transitional room. Featuring a plush seat base filled with high density foam and fiber wrap, diamond-tufting adds a comfortable, classic feel. 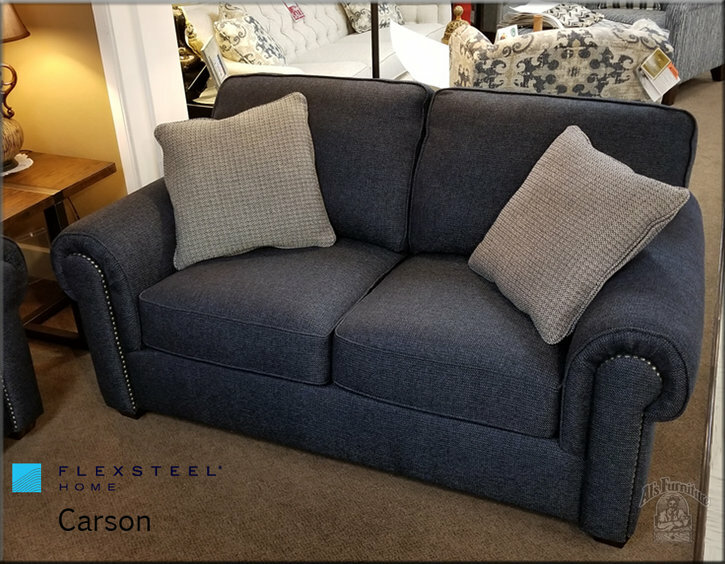 Completing this piece with an ornate touch are rolled panel arms with nailhead studs, tapered wood block legs, and button tufting along the seat base. 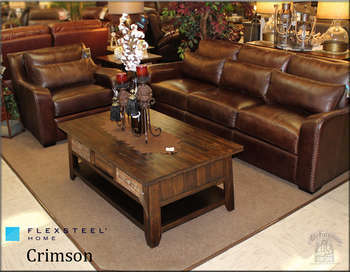 Take your living room to the next level with the Crimson Sofa Collection from Flexsteel. The Crimson is a beautifully exquisite, comfortable sofa set made with all-grain leather. 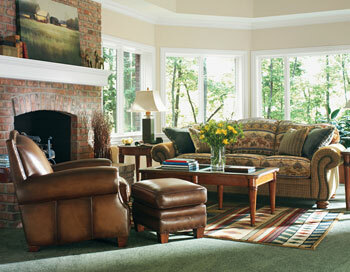 The surface of all-grain leather is unique and tells a story with the natural imperfections and marks. 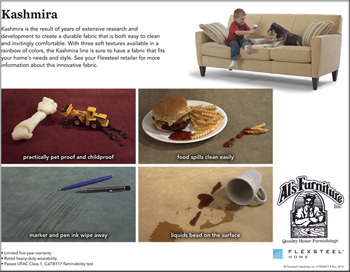 It is extremely strong and durable. The next time you entertain, your friends and family will love sitting on the Crimson sofa, loveseat, or chair with ottoman. Each one has leather bolster pillows and contoured arms with baseball mitt stitching, for a unique look. 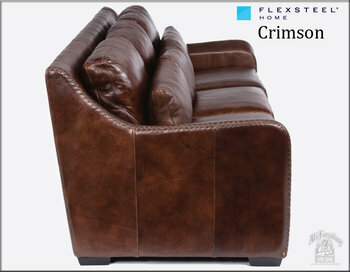 This collection only comes in leather and only in one color. Al’s Furniture brings you the best in quality, style and comfort. 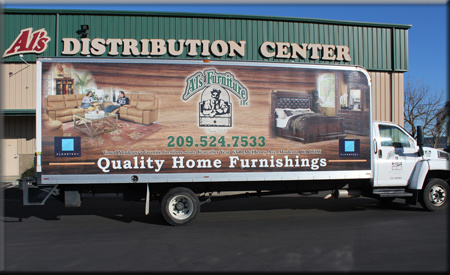 Come visit us wayout McHenry avenue and see why Al’s furniture has been in business for over 50 years. 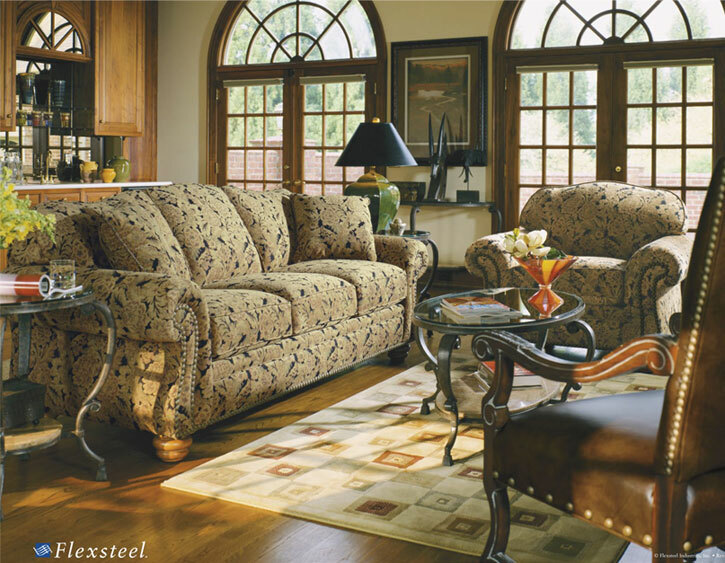 The Flexsteel Dana Group will bring you true style that will stand the test of time. With the understated modern design and quality materials, this scaled group features a contemporary rolled arm, finished hardwood legs and a tight back for an architectural feel. 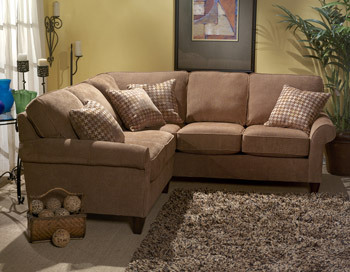 Plush cushioning under the perfect soft fabric fits in any décor and two throw pillows are included to accent the sofa. 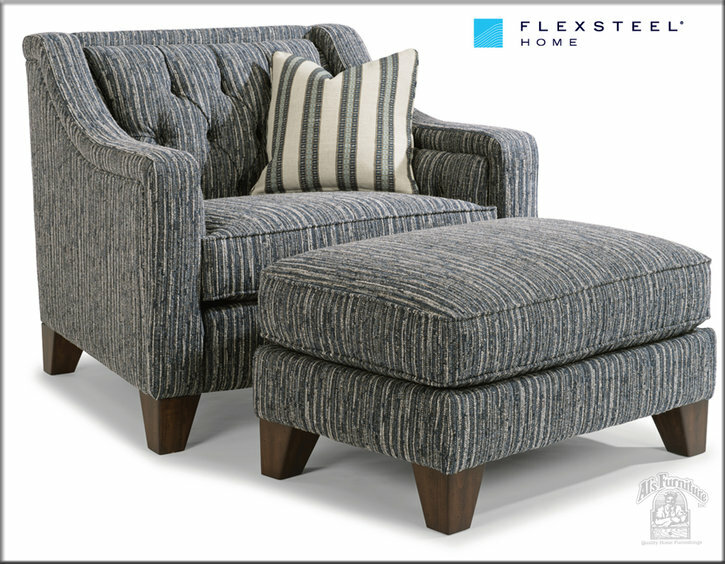 Finish your room off with the Dana Loveseat, Chair and Ottoman, in an accent fabric of your choice. This collection can be ordered in over 1,000 different fabrics to match your home perfectly. This cute Flexsteel Digby Sofa comes in two widths, 70" or 80". When you give your old sofa to your children when they’re going away to college, this will be a great replacement sofa for you!!! 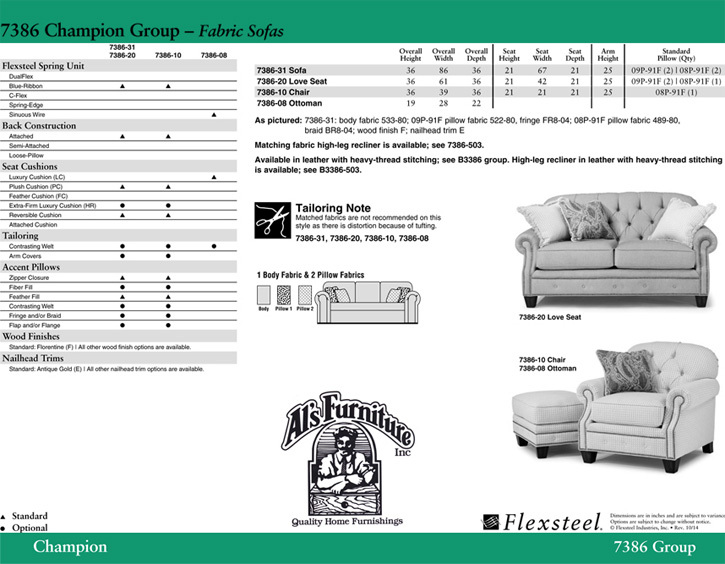 Choose from over 1000 fabrics. 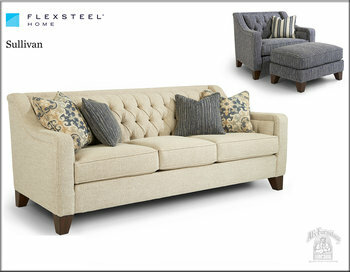 Features the Flexsteel Life-time-guaranteed blue steel seat spring! 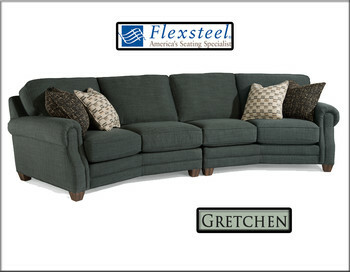 The Flexsteel Gretchen Collection’s style brings a mix of traditional sophistication to any room with its sloped, long-line arms, and feather cushion option. 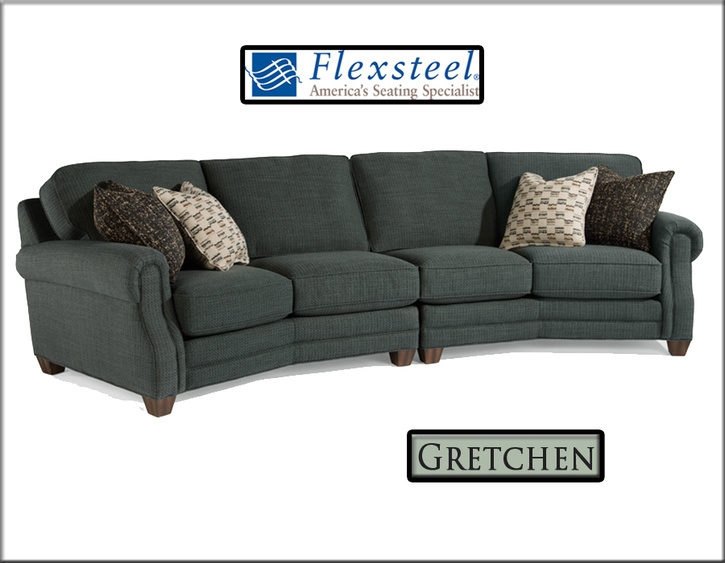 The Gretchen collection can suit every seating need for your home with many seating configurations including; a classic sofa and loveseat, a chair, sectional pieces, conversation sofa, and a very glamorous octagonal ottoman! 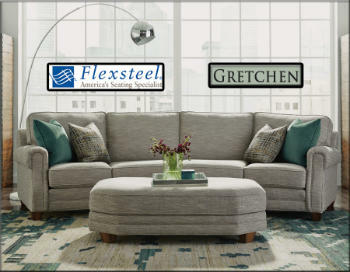 Stop by Al’s Furniture today, and see how you can personalize your Gretchen group with your choice of 1,500 fabric options. 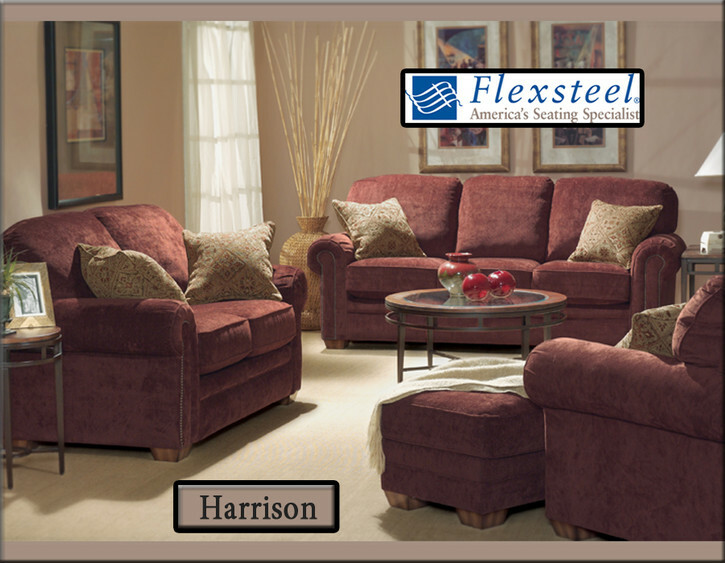 With the Flexsteel Harrison Collection, you are sure to find something you’ll love! 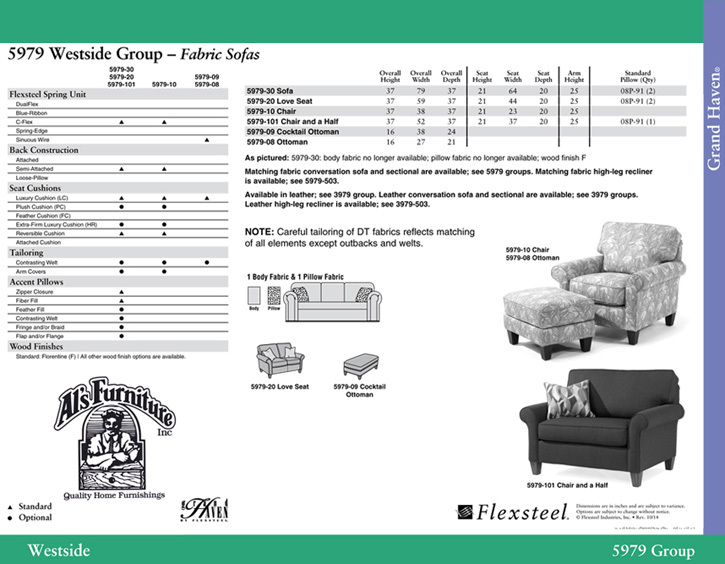 This group is extremely versatile with flexible seating options. 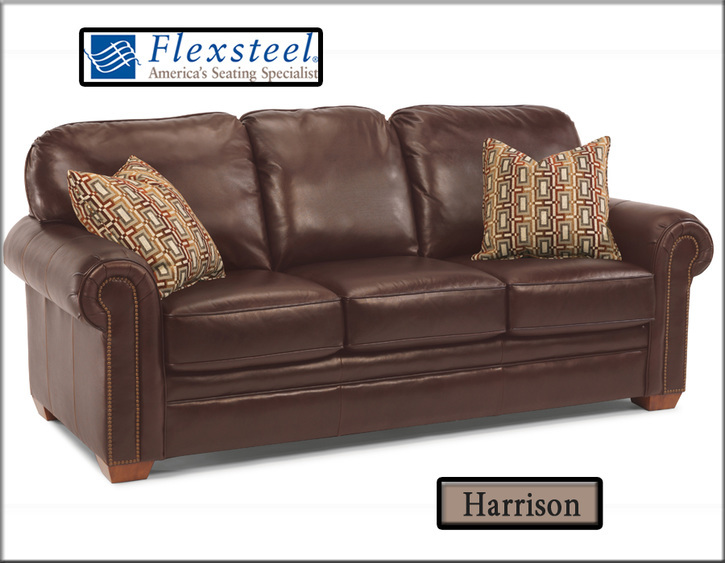 The Harrison group is available in both fabric and leather. Generously scaled with high backs, all pieces offer luxurious comfort and remarkable styling. 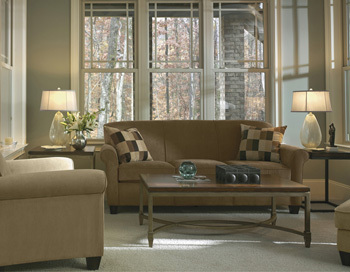 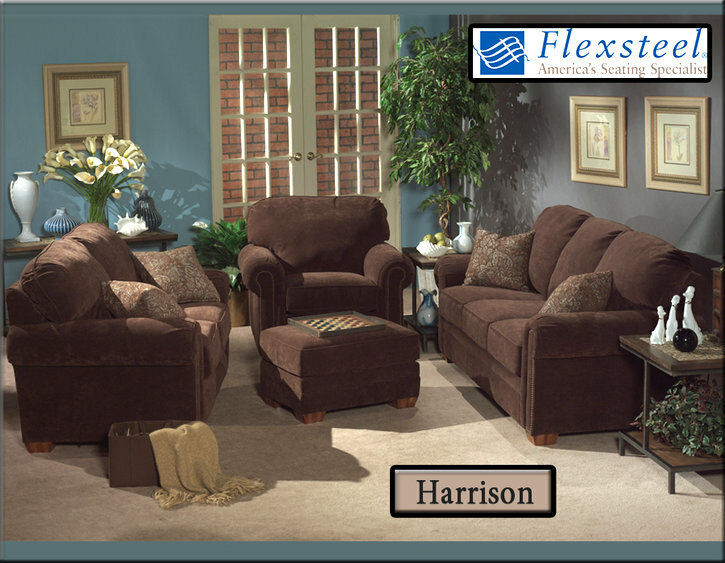 The Harrison Collection is available in a sofa, loveseat, chair, and ottoman. 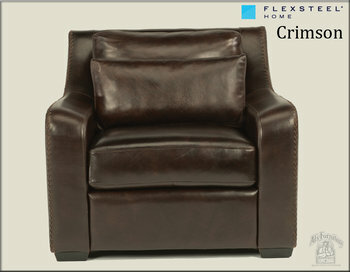 You have the choice of a plush or firm cushions. 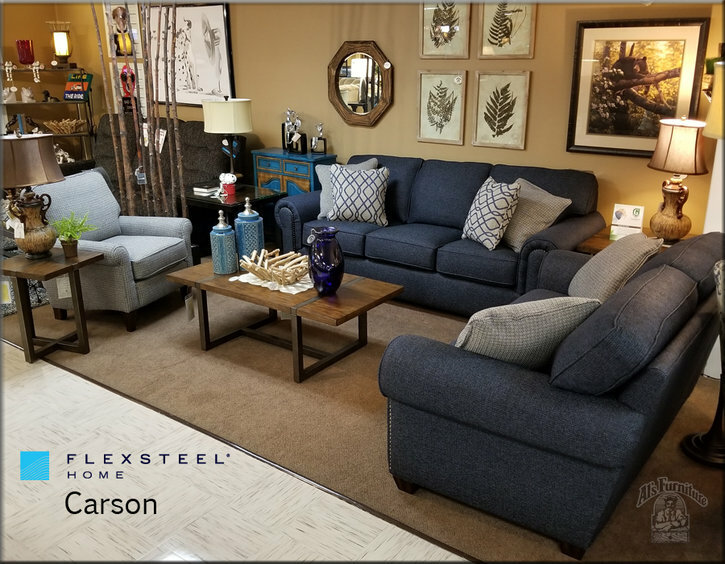 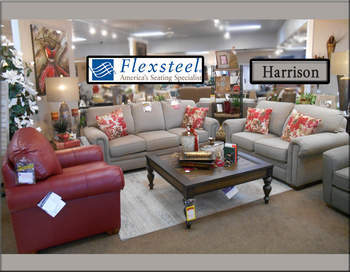 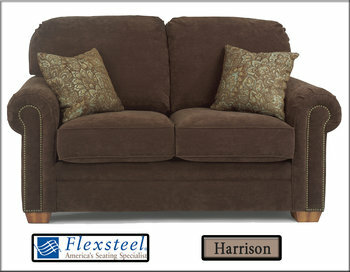 Next time you’re waay out McHenry Avenue stop by Al’s Furniture and see Flexsteel’s Harrison Collection. 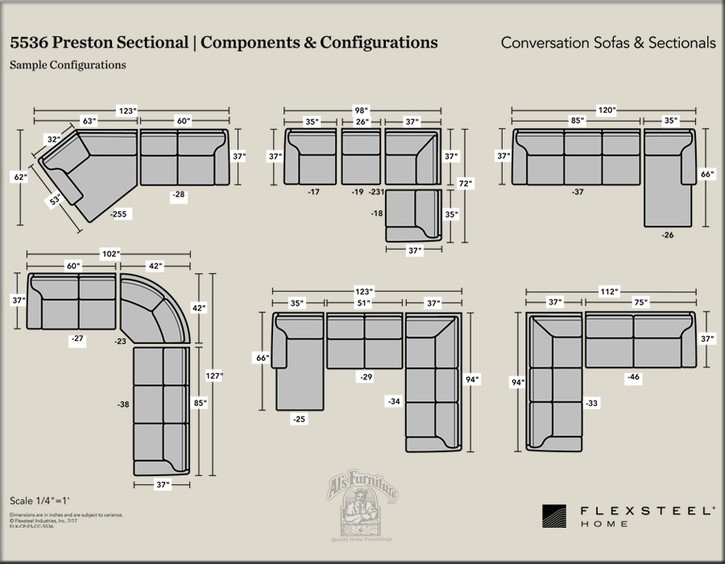 The Preston Sofa Collection by Flexsteel has a comfortable, traditional styling with flexibility to customize this group to suit your preferences. 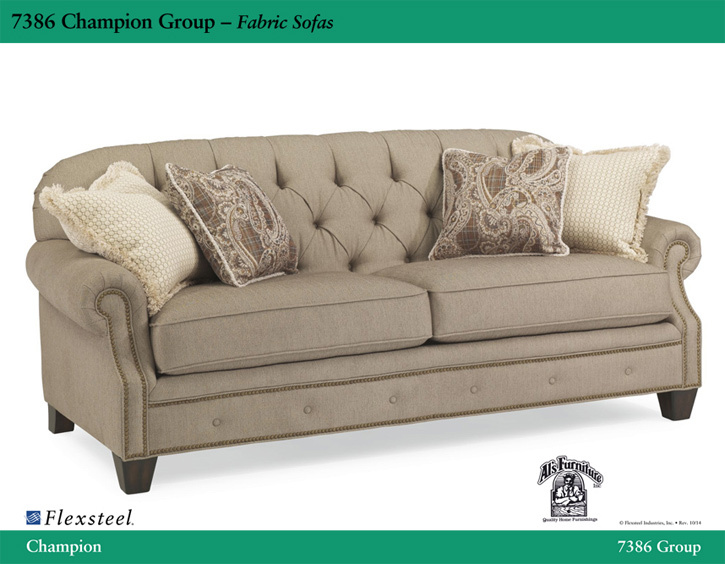 Arms are generously padded for comfort and nailhead is offered in six different styles/colors to compliment any fabric choice you make. 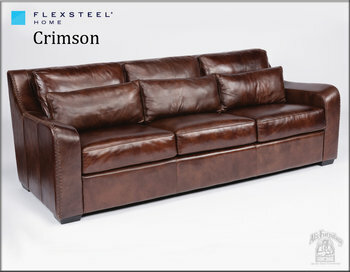 And, there are over 1,500 different fabric and leather colors to choose from. The Preston’s overstuffed back cushions and comfortable seat cushions radiate an inviting design that begs you to sit and stay awhile. 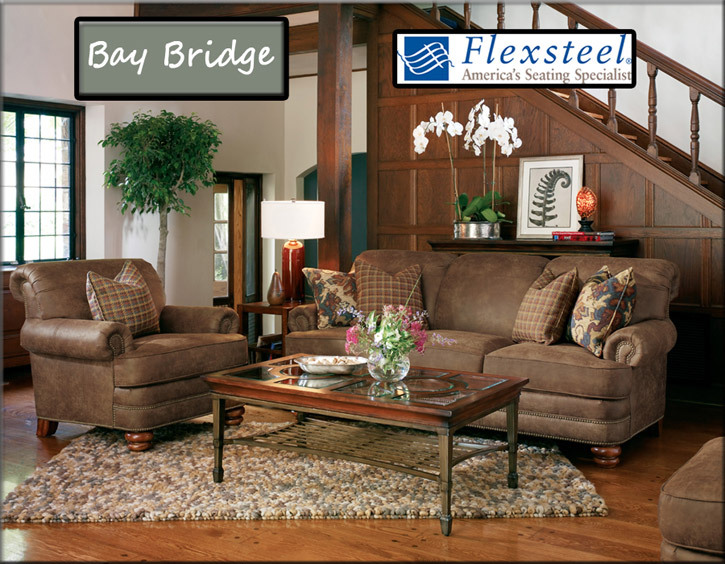 Flexsteel’s design and construction go hand in hand to create comfortable, long-lasting furniture featuring durable wood frames, Blue Steel Springs, and exceptionally soft seat cushions. 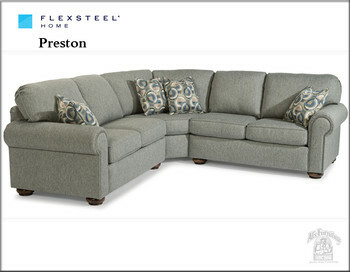 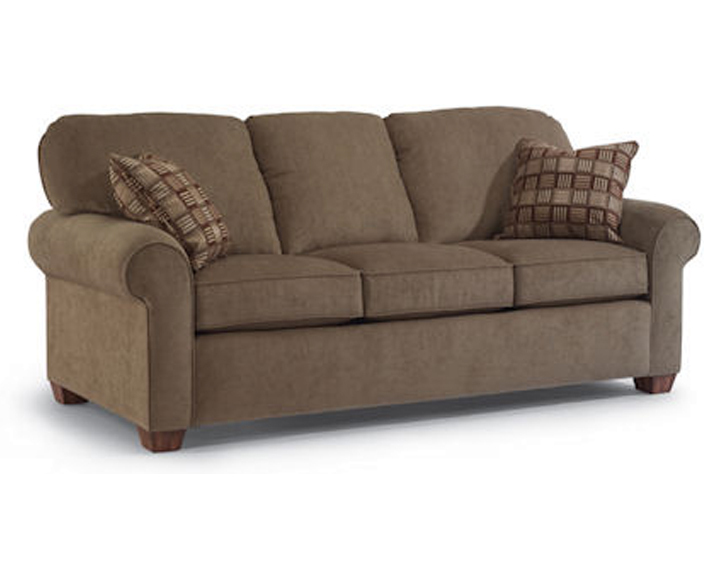 The Preston is available in a sofa, loveseat, chair, and a variety of sectional configurations. This collection is only available as stationary, non-power. The Preston Collection will add elegance, comfort, and style to your home. 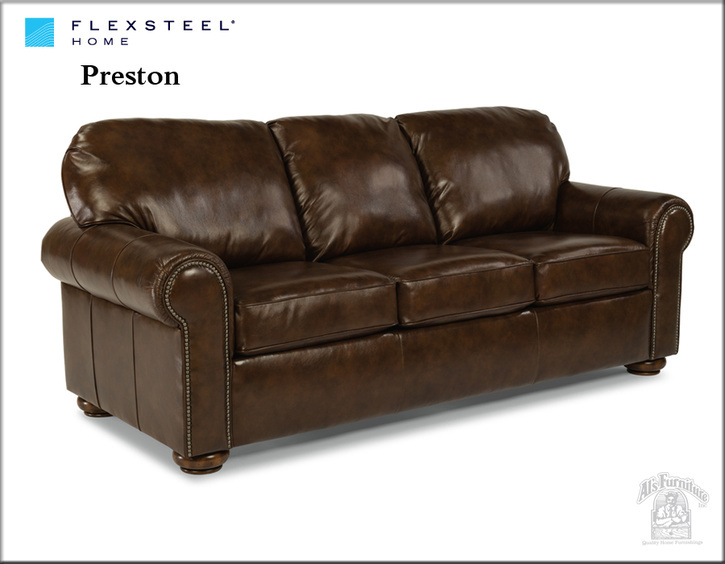 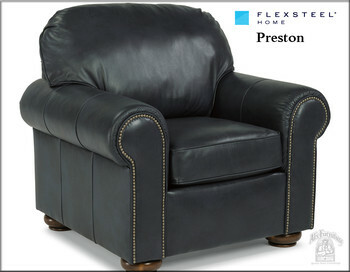 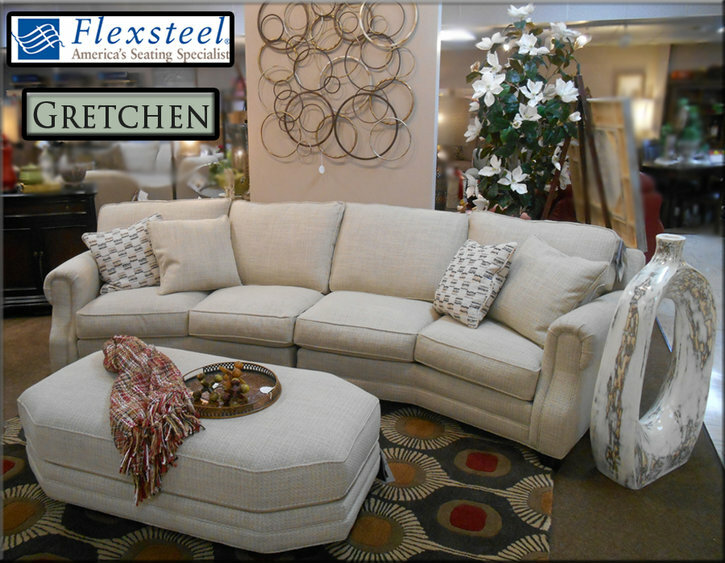 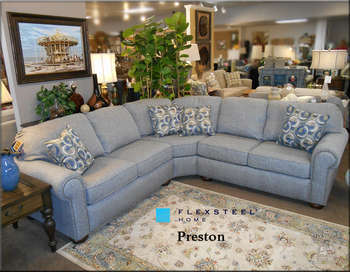 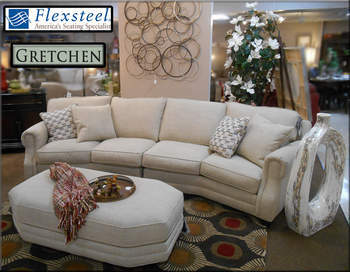 Come in to Al’s Furniture store in Modesto to see the Preston by Flexsteel. The Flexsteel Randall Sectional Sofa Collection has a timeless frame, and is brought up to date with contemporary lines. 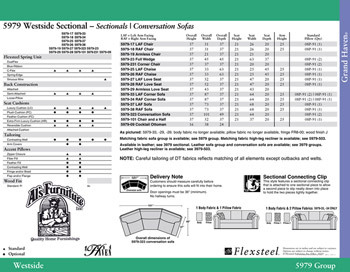 This unique sofa collection features a lower and deeper seat. 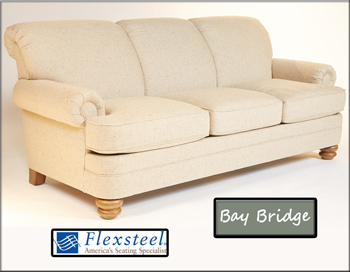 We have it on display in our showroom with feather down cushions, although it is available without cushions. 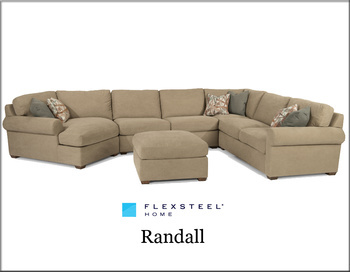 The Randall Sofa Collection includes a wide selection of modular pieces to configure a perfect fit for any space. 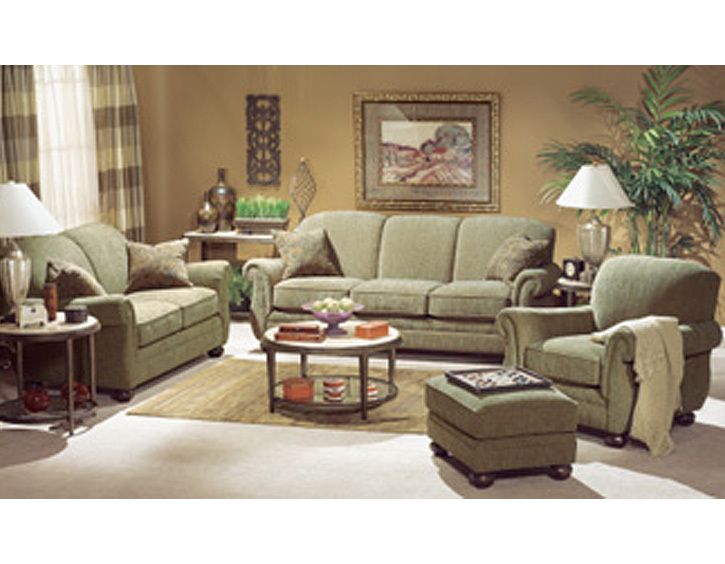 This set has over 2,500 fabrics to choose from and is made in the USA. 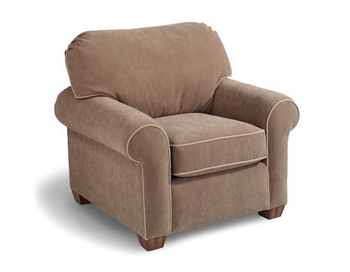 Note: it is not available in power. 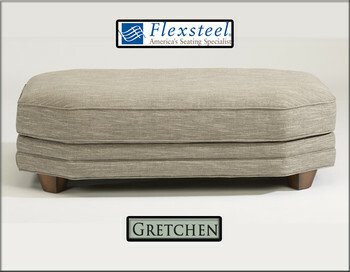 A matching ottoman is also available. 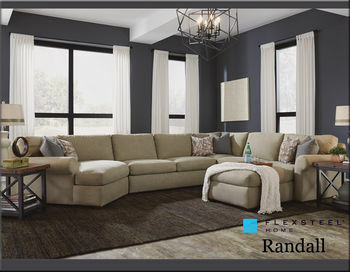 If you’re looking for a comfortable, quality sectional with custom options, look no further than the Randall Collection. 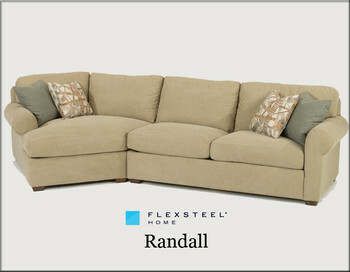 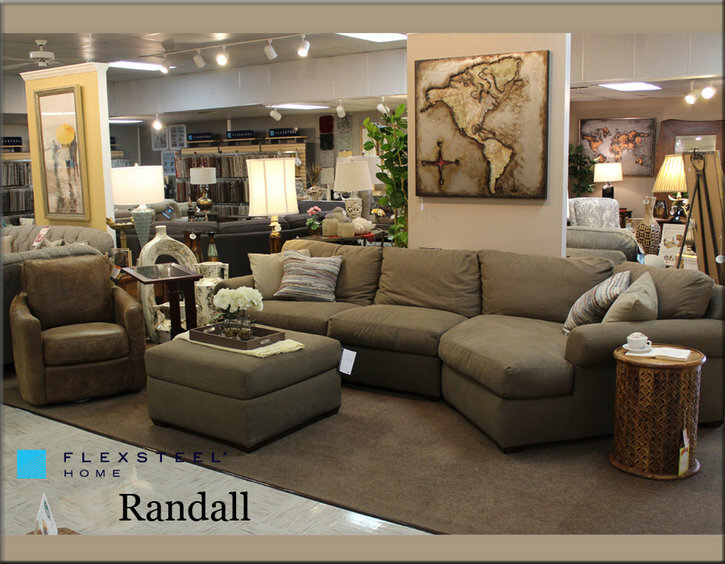 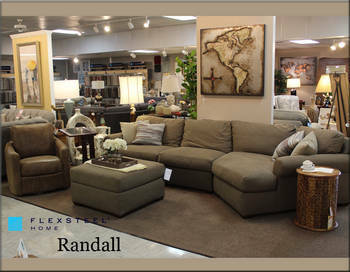 Stop by Al’s furniture store in Modesto, and feel the comfort and quality of Flexsteel’s Randall Sectional Sofas. This Flexsteel Sullivan Stationary Sofa Collection is sure to be the crown jewel of any room. 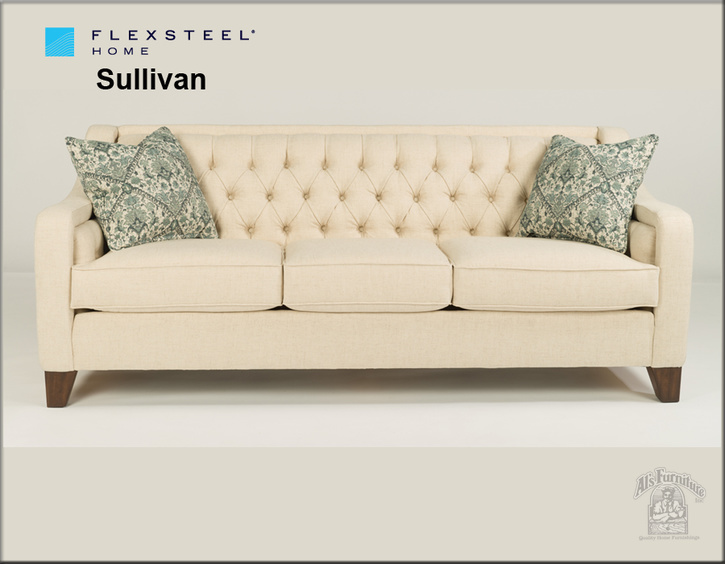 Reminiscent of the Victorian era the Sullivan’s sleek silhouette is balanced by traditional tufted detailing that wraps along the back and inner arm. 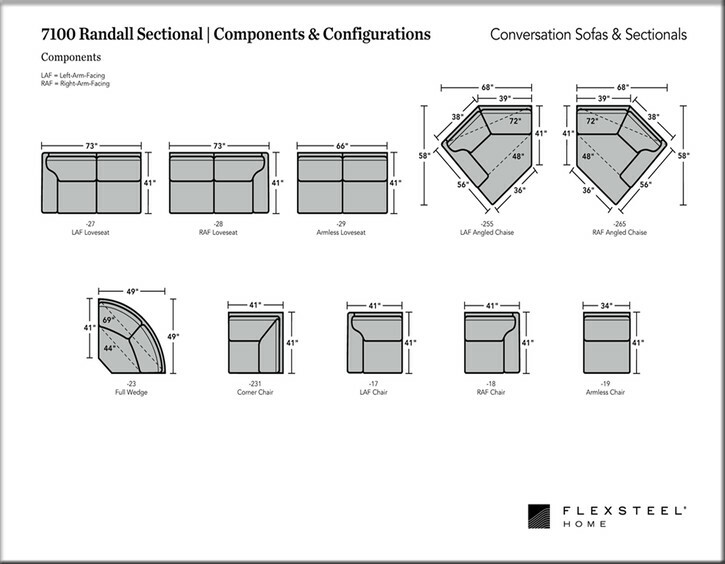 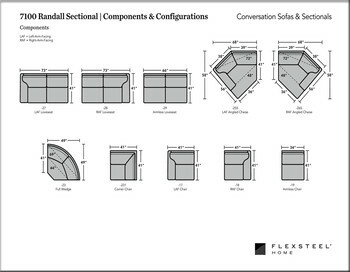 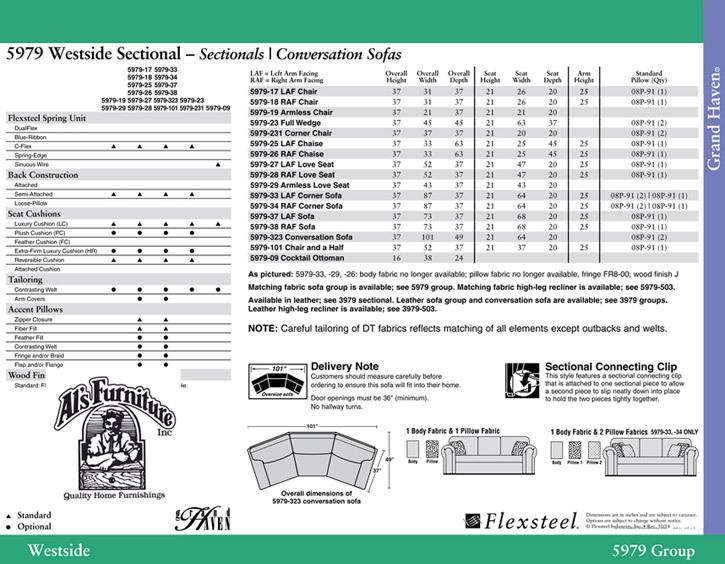 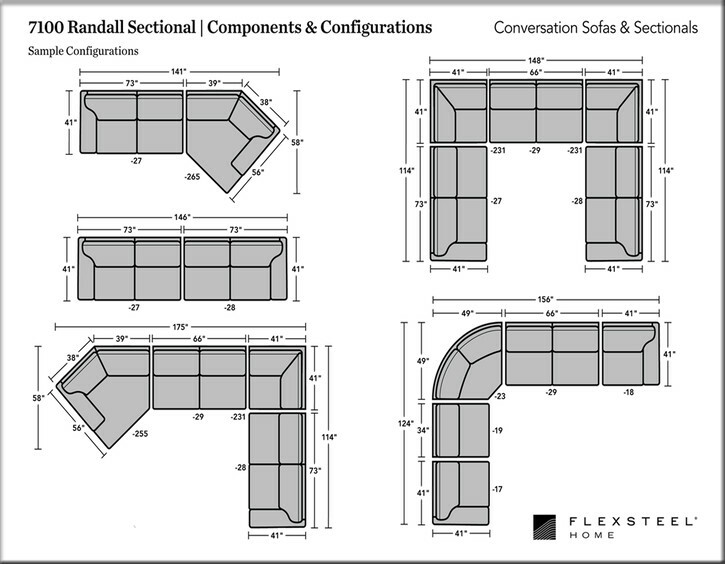 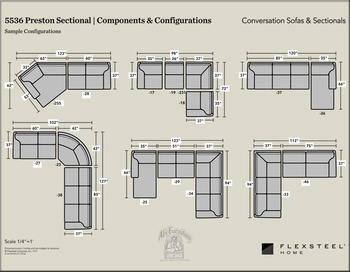 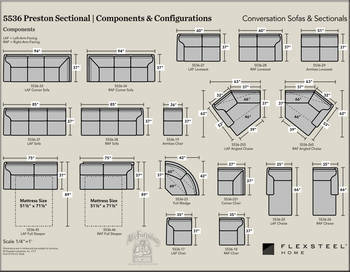 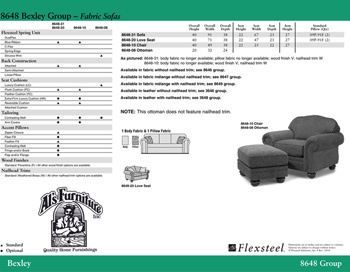 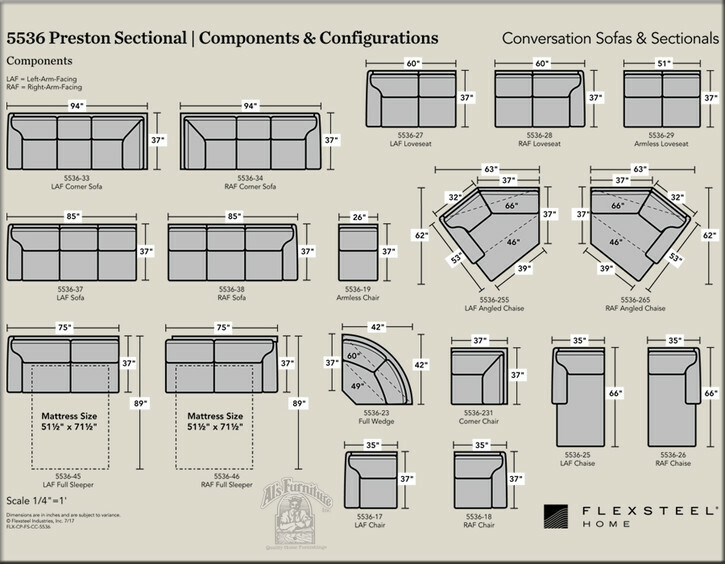 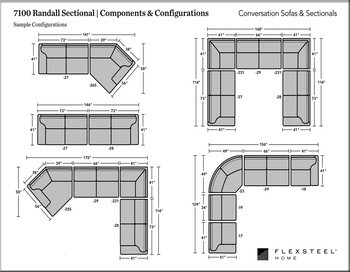 You can customize this Flexsteel sofa set with your choice of 1,500 fabrics from our Flexsteel Design Area. 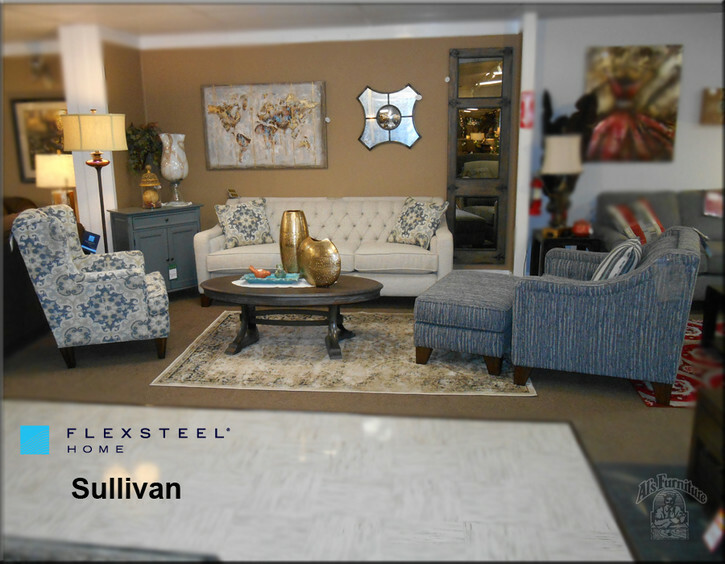 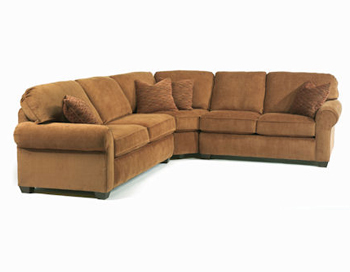 This high quality Sullivan Sofa Set is made in the USA. 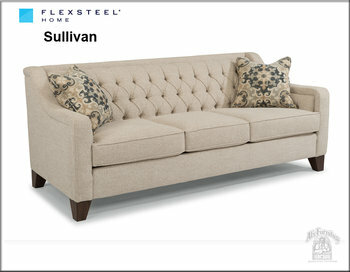 The Sullivan is available in a sofa, loveseat, chair, and ottoman. 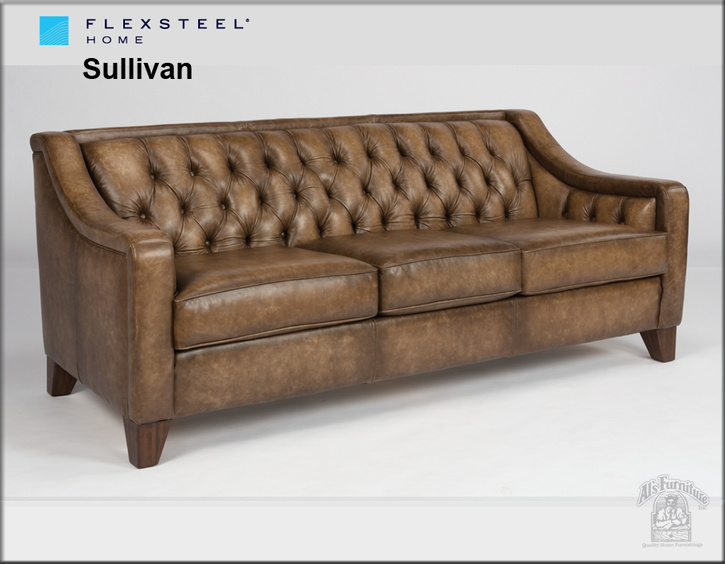 Not available in leather. 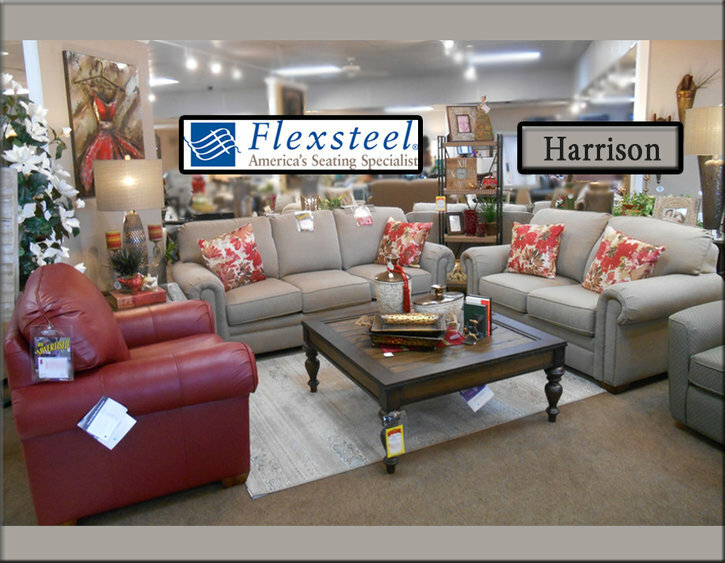 For the furniture store with the best selection of Flexsteel furniture waiting for you to try out and find the set that’s perfect for you, come see us at Al’s Furniture. 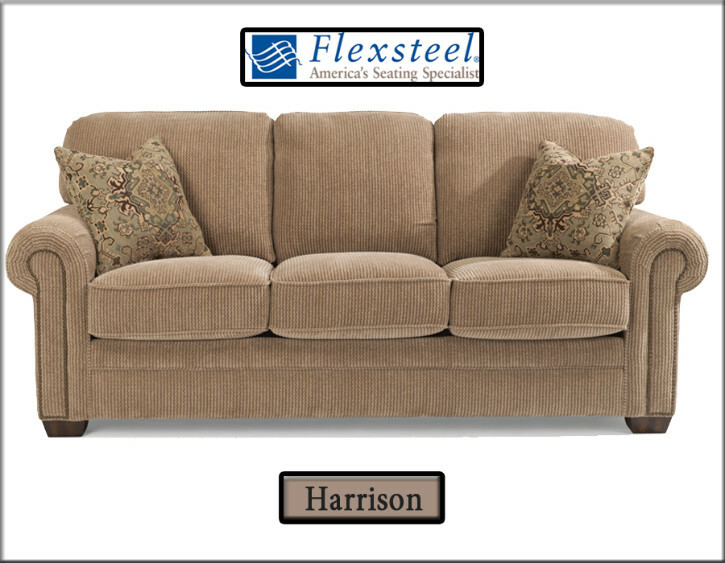 Contemporary and refined, the Flexsteel Thorton Group has a comfortable classically tailored style. 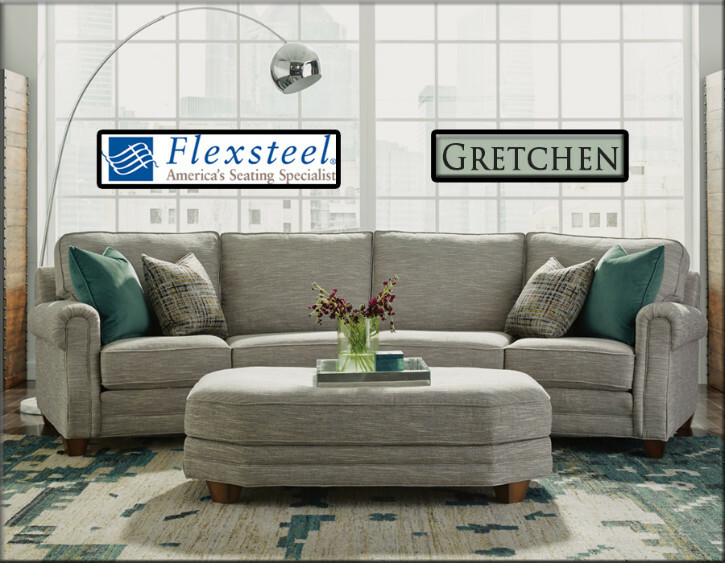 From the Loveseat to the Sectional, our great sales staff can help you build your own modular group to fit your specific room size. The Flexsteel Westside Group, like all Flexsteel furniture, is comfortable, good-looking, and made to last! 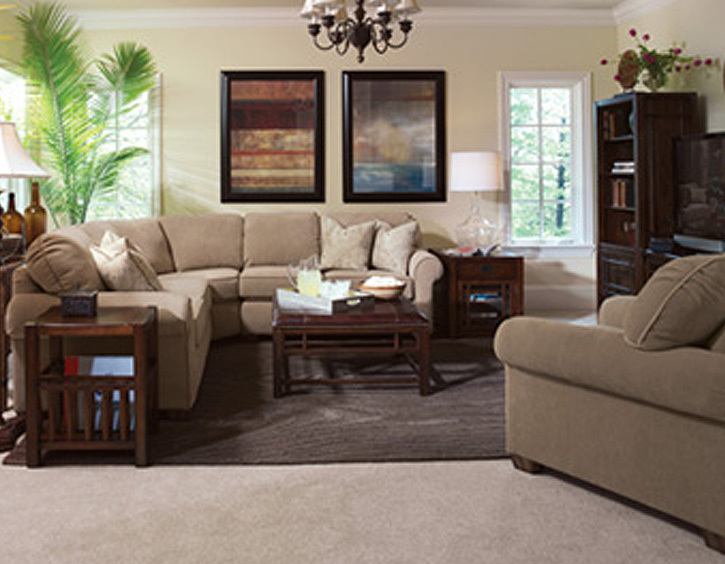 This versatile collection offers a great fit for any room. 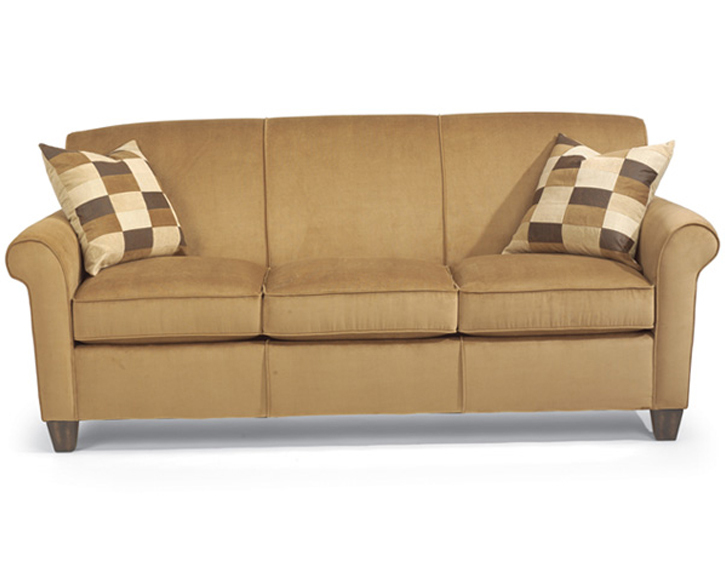 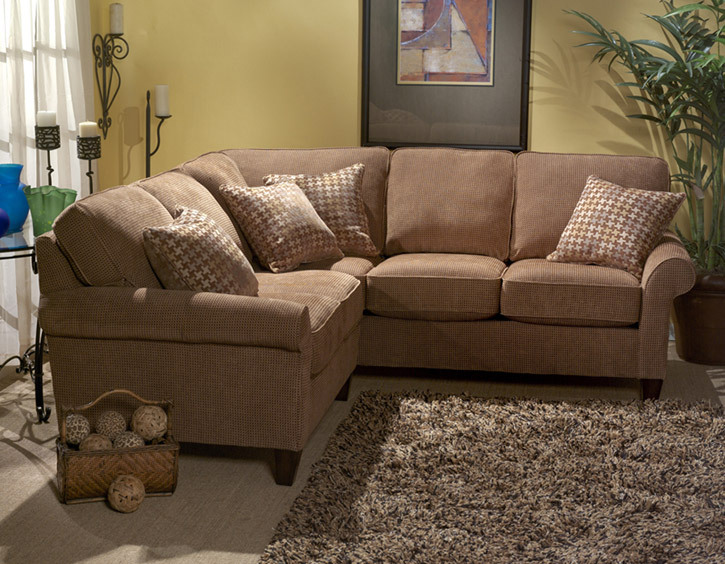 Plush cushions and soft fabrics cradle your body in softness as you lounge upon this sofa group. 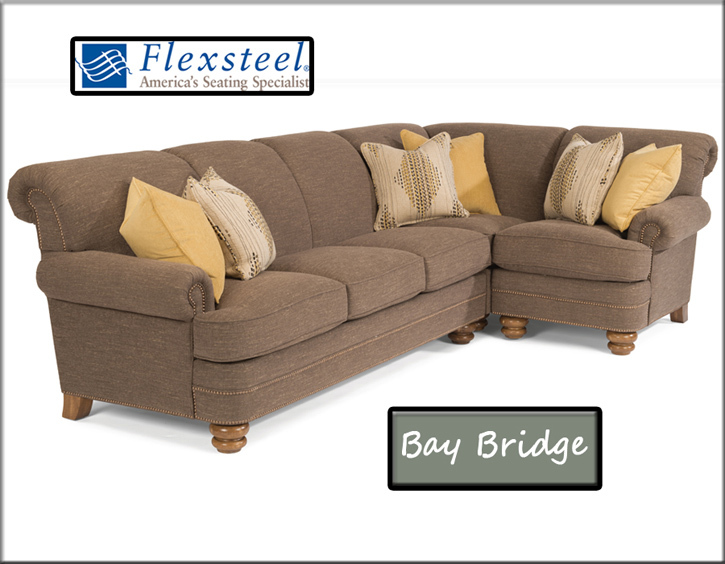 Perfect for large families or large living spaces, this group provides ample room for everyone to sit comfortably. 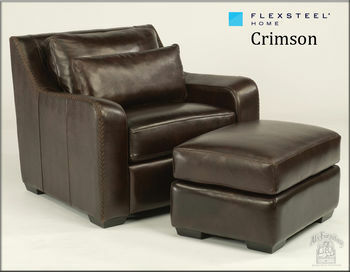 Watch your favorite sports team or your favorite movie with the kids, all within the supportive design of this group. 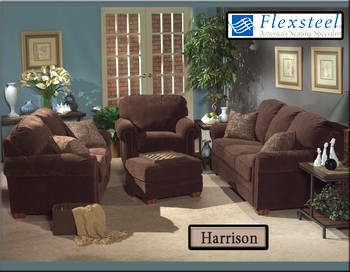 “Versatile” is the Westside’s middle name, as you can configure this set to fit YOU!! 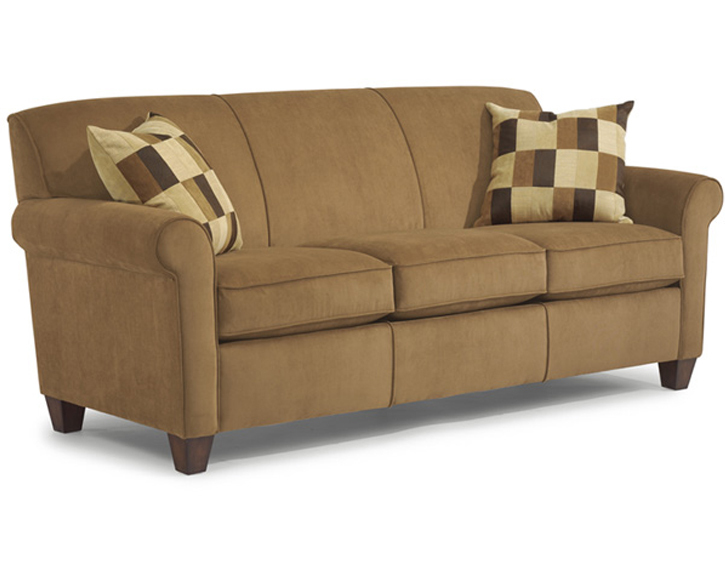 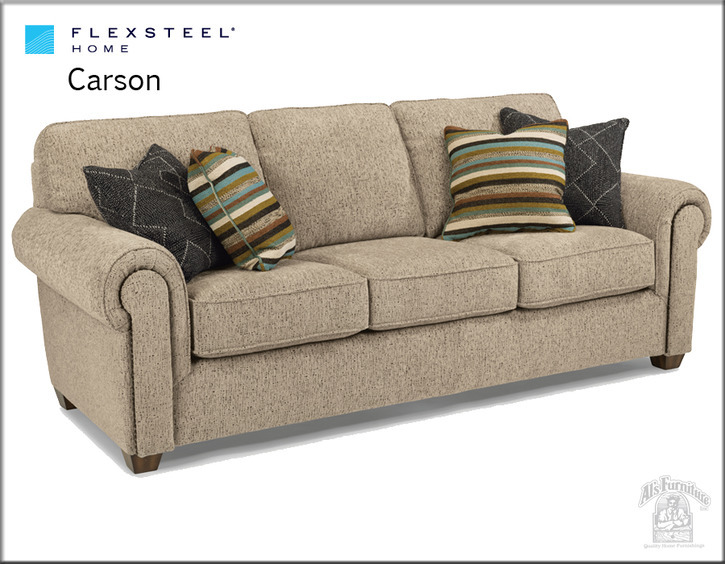 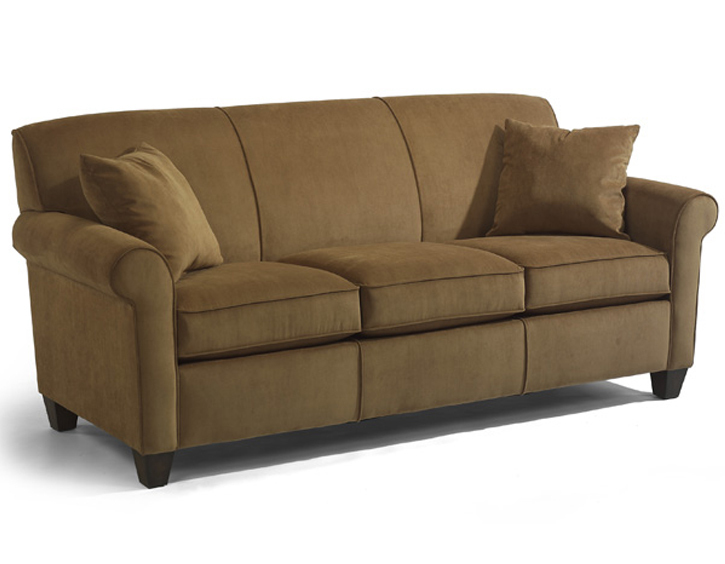 The Flexsteel Winston Sofa is a great style sofa to have fun with. 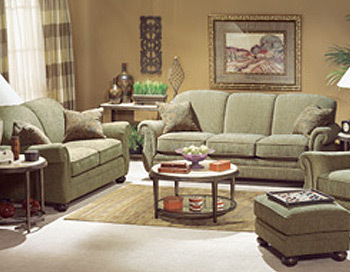 Dress it up for your living room or dress it casual for your family room. 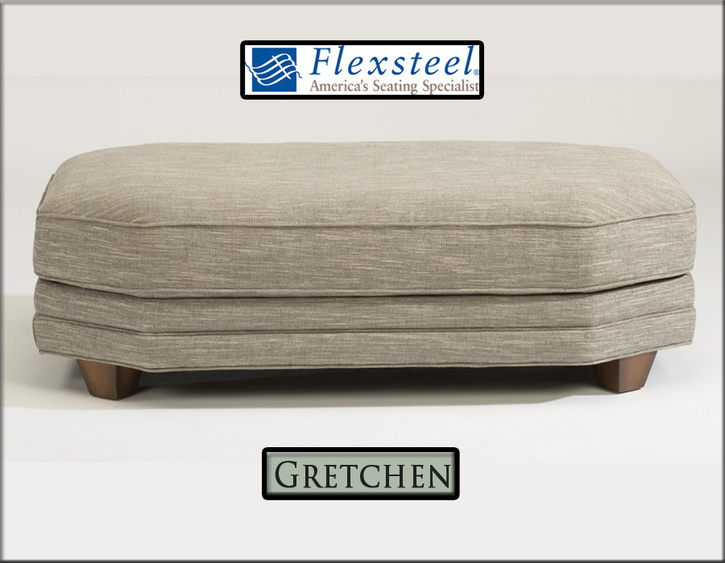 With over 1000 fabrics we are sure we have just the one for you! 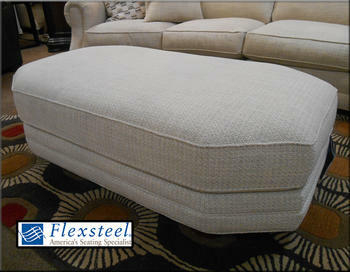 These occasional tables are in stock as well. 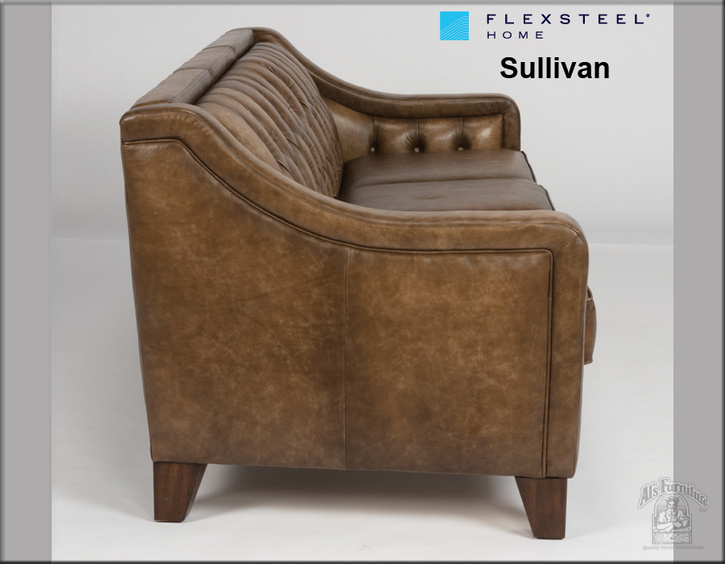 Features the Flexsteel Life-time-guaranteed blue steel seat spring! 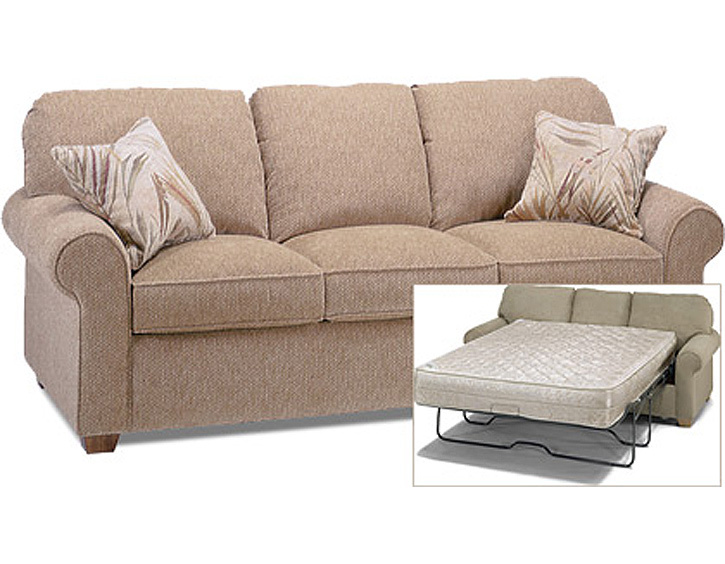 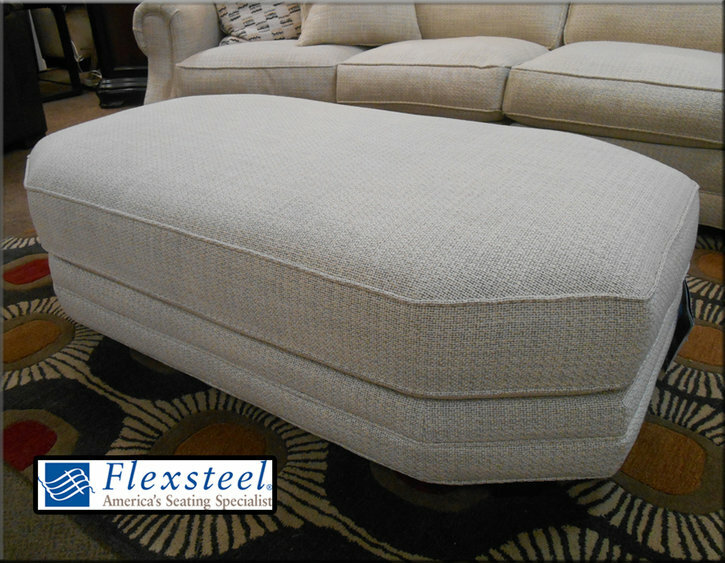 The Flexsteel Sofa Sleeper comes in two sizes; a Queen Sleeper with a width of approximately 86" or Full Sleeper with a width of approximately 78". 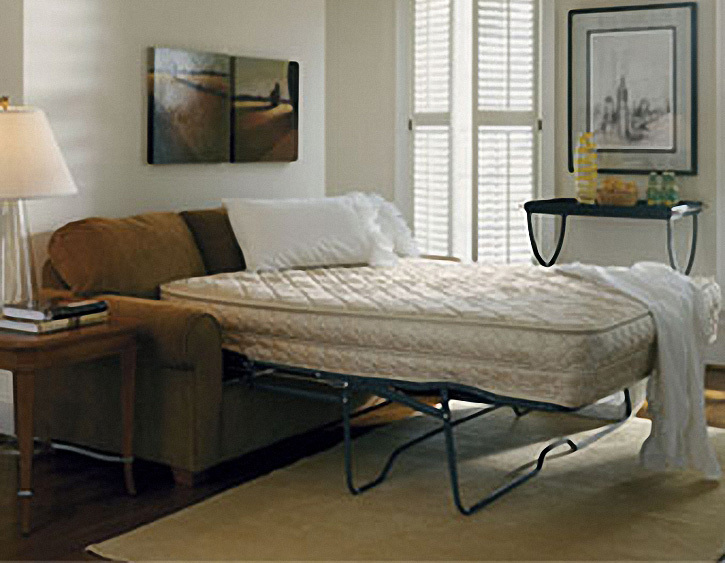 There are three mattress choices; Cozy Comfort, Memory Foam or Air Coil. 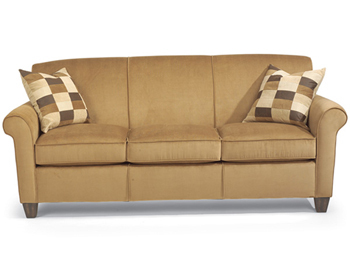 The Sofa can be special ordered in over 1000 different fabrics! 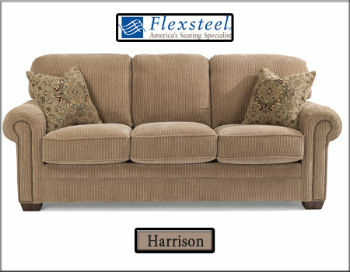 ***This Sleeper Sofa is Special Order ONLY, see store for details.